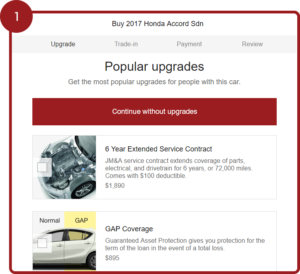 The new era of car buying has arrived at Rock Honda. Click to Drive allows you to purchase your next car, truck or SUV online without ever stepping foot in the dealership, all in 4 easy steps. Click to Drive will revolutionize the way you think about buying a car. This means no more waiting around in showrooms or complicated back-and-forth negotiations. Our goal is to make your next car buying experience as simple as possible – no stress, no gimmicks. 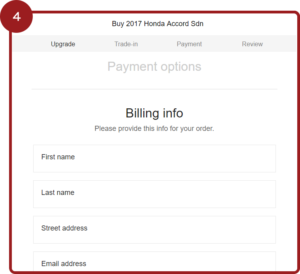 To get started, after you’ve selected your vehicle, click the green “Buy Online” button to begin. Choose from a variety of provided options to build your perfect offer, including extended warranties, maintenance packages, GAP coverage and more. 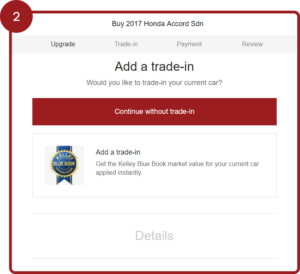 Receive an instant trade-in value with the Kelley Blue Book trade evaluation tool. After you receive your quote, your trade will be added to your purchase. Choose from 3 different payment options: lease, finance or pay the full balance in cash. 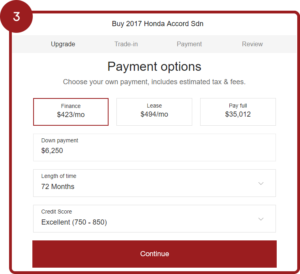 You also have the ability to adjust the down payment, term length and lease mileage allotments to find the perfect monthly payment for your budget. Provide the billing information for your order. Your order is then sent to the dealership, who will complete the transaction upon approval.